Orem's Colonial Heritage Festival expands understanding of whose history is worth knowing. 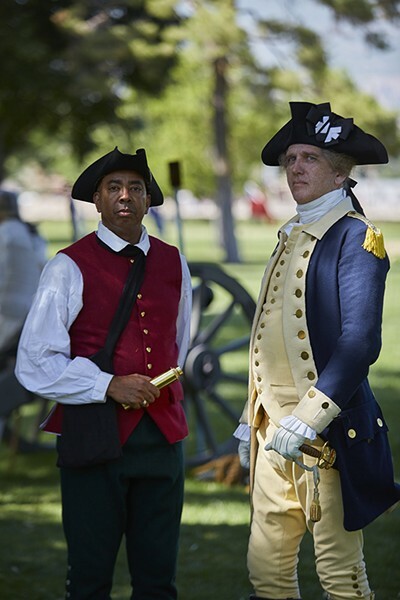 Dan Shippey couldn't bring himself to ask Patrick Martin to play the William "Billy" Lee to his George Washington in this year's Colonial Heritage Festival in Orem. "I can't imagine asking a friend to portray your servant, your slave," Shippey says of requesting a man he's known for 18 years to act as the slave Washington purchased from a rich Virginia widow. But Lee—who accompanied Washington for 20 years, through the Revolutionary War, and helped evolve the Founding Father's perspective on slavery—is not a well-known figure in most Americans' recounting of their country's early history. "How often do you see Washington pictured along with Billy Lee? You don't," Shippey says. "Billy Lee, we don't hear that name. And largely because it's uncomfortable." Martin, who is African-American, spared his friend the discomfort, asking Shippey if he'd like to expand Washington's role to include interactions with Lee. For the first time in the festival's 12-year history, Martin played Lee last week, often appearing by Washington's side during the three days of colonial history role-playing. Daniel Pugmire, festival co-chair who also played the town's scribe, says organizers had been wrestling about how to incorporate slaves' perspectives at the educational event. "It's something people don't talk about." Martin, passionate about historical accuracy, generally cautions against reenactors viewing slavery through 21st-century eyes. "Sometimes, in the tendency to be inclusive, you overcompensate," he says. "People have this notion that slaves were beaten all the time. Would you beat your car for not working? "They're telling history as it was," Martin says of the festival, its organizers and the almost 150 people who portrayed Colonialists. "You learn so much when you get the facts from someone who is not trying to spin history." Lee wasn't the only addition this year: Ngoma y'Africa, a Provo-based acting troupe, performed a short play on July 3 and 4 that depicted the agonizing decision a family of slaves had to make when fathers and sons were offered their freedom—but only theirs, not their wives' and mothers'—in exchange for fighting for the British. Onstage, the kin argued over splitting up the family, sparring about whether the fighting-age men should risk their lives to wage war against the patriots in order to gain deliverance. "You can decide on your own, but you're not taking my son," a mother told an older man during the performance. "Freedom isn't freedom if you're lying dead on a battlefield." Yvonne Baraketse, head of the Ngoma y'Africa Cultural Center, first moved to the U.S. in 2004 after surviving the Rwandan genocide a decade earlier. "I really hope they get to realize how lucky they are to be in a country that is free, that is peaceful, and that they realize people had to fight for that freedom," Baraketse says of the crowds who witnessed the performance. "I've been through a war myself; I know the turmoil of oppressing others because they're different." Baraketse says the troupe's participation aligned well with Ngoma y'Africa's goal of educating communities on African heritage. Half the actors were born in Africa, while the other half were African-Americans, Baraketse points out, allowing for a range of perspectives. 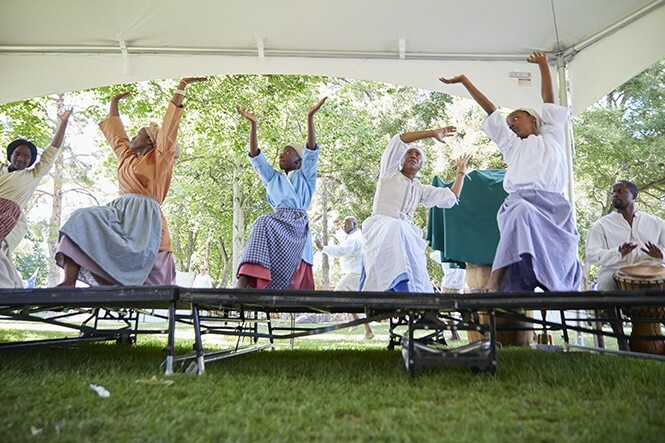 African-Americans helped African-born actors understand America's slavery history, while African-born actors explained the cultural context of songs and dances they performed at the play's beginning and end. "That's what made it beautiful," Baraketse says of the strength born from the cast's diversity. In addition to observing performances and casually chatting with long-dead historical figures returned to life, festival-goers participated in philosophical discussions with founding fathers as they hammered out the particulars of drafting the U.S. Constitution. On Day 2 of the festival, actors playing James Madison and Patrick Henry workshopped their ideas in front of a large crowd, asking how to set up a system of checks and balances to dilute presidential power and how to preserve the rights of individual Americans. Turning their attention to who should be allowed to have a voice in the political process, faux Madison and Henry mentioned that each slave's voice should constitute three-fifths of a vote. A young white girl around 10 years old slid toward the edge of her seat and interjected loud enough that her voice carried above the crowd. "Slaves should count as a full vote," she said. "They are people, too." For a short time, 21st-century America collided with the perspectives of its founders before Madison and Henry said they'd take her viewpoint into consideration. Pugmire says organizers are pleased with the changes to this year's celebration based on feedback they received. Broadening the range of performers allows participants to expand their understanding of whose history is worth knowing, beyond obvious figures like Washington, Thomas Jefferson and Benjamin Franklin. Shippey, who has been studying and portraying Washington across the country for a decade, has long known of Lee's close relationship with America's first president. Washington inherited his first slave at age 11, Shippey says, but gradually came to see their humanity as he grew older, freeing Lee immediately upon his death and making provisions for other slaves to be freed after his wife, Martha, died. Shippey says he hopes people who saw the Lee portrayal left understanding how integrated slavery was into people's everyday lives. But he also hopes they, like Washington, saw Lee's humanity and caught a glimpse of his impact on American history. "I wanted them to see this man who had given incredible service. And, even though he was an enslaved man, ended up being someone I would consider a founder," Shippey says. Pugmire hopes to add Native American perspectives in coming years, to deepen the public's knowledge of the country's founding and show it wasn't just a bunch of white men who shaped the U.S. into what it is today. "This country was not formed by one person, it was formed by many," Pugmire says. "What built this country was the conglomerate; the melting pot." People like Lee and the family played by the Ngoma y'Africa troupe are often lost to history and are considered small-time actors in the forming of American history. But that view, Shippey notes, is a mistake. "These are people who really contributed to building our world," he says.